Bluebird records were part of the RCA-Victor Corporation. It was created as a budget label by RCA-Victor in 1932 in order to enter the discount-record market. Original Bluebirds were 8 inches but were dropped by March of 1933 in favor of 10in. records. You will note in the Bluebird series, they say electrically recorded. “Electrically Recorded” came about in the mid-1920s using microphones to capture sound rather than simply playing into a horn. Bluebird: Early 1933 10in. Blue and Black coloring. By Sept. 1933 the label changed to a blue and cream cover. This is sometimes referred to as Bluebird “Buff” by collectors. Bluebird: Late Sept 1933 to 1937. By Sept. 1937 the record label had changed to dark blue and gold coloring. The Bluebird bird logo was now shown against a musical stave. Shows the RCA Dog and Bluebird bird logos together. However, in Nov. 1942 Bluebird added the “30” prefixes to its labeling. Color is still dark blue and gold. Bluebird: Nov. 1938 lasting until the late 1940s. By the late 1940s the Bluebird logo is dropped completely. The RCA Dog logo is instead displayed prominently. 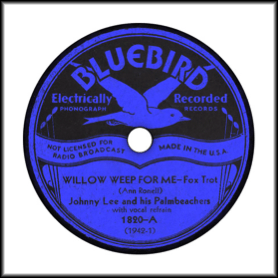 Bluebird records become indistinguishable from standard RCA records except for the dark blue and gold coloring and a small notation of “Bluebird Series.” at the top. Late 1940s. Note the Bluebird Series at the top. 30- Popular, (U.S.A. and Canada), 30-0801 (November 1942) – 30-0834 (March 1945). 31- Popular, (U.S.A.), RCA Victor – Bluebird series, only a handful ever used beginning at 31-0001 (July 1949). 33- Country, (U.S.A.), 33-0500 (November 1942) – 33-0539 (December 1945). 34- Race, (U.S.A.), 34-0700 (October 1942) – 34-0748 (May 1946). 55- Canada only, Country, 55-3201 (January 1943) to at least 55-3244 (May 1949). 55- Canada only, French Canadian, 55-5201 (January 1943) to at least 55-5409 (May 1951). 58- Canada only, Country, RCA Victor – Bluebird series. 58-0001 (March 1946) to at least 58-0215 (circa October 1951). Though this may be a reissue of the 21- prefixed series. In addition there was also a series of Children’s records. These were issued with serial numbers ranging from 1 to 1000 with prefixes “BK” and “BY” from May 1936 to the early 1950’s. Notes: Glenn Miller first recorded Moonlight Serenade (June 1939), Chattanooga Choo Choo (Sept 1941) and In the Mood (Nov 1939) on the Bluebird label.